Protect your rights and maximize your payout after a Texas car accident. We answer key questions and show you how to build a strong insurance claim. Texas has its fair share of car accidents. Over 230,000 people are injured on Texas roadways each year.³ That’s over 600 people injured in a collision every day! Car accidents happen in the blink of an eye. It takes time and money to recover from serious personal injuries and property damage. Your financial future depends on the success of your auto insurance claim. This guide can help. Here are 11 steps to help you build a strong and successful insurance claim, along with answers to the most frequently asked questions following a car accident in Texas. When do I have to report the accident to local police? What information about the accident will the 911 dispatcher need? Which police department will respond to the scene? What if the police issue a traffic citation? How do I get a copy of the police crash report? What are my legal duties after an accident? Can I be held liable for helping someone who’s been injured? What if I hit a parked car and no one was in it? What if I’m injured in a Texas car accident? Will the insurance company pay for my damages? How do I start gathering evidence for my car accident claim? Why notify my insurance company if the accident wasn’t my fault? Do I have to report to my insurance company if no one was injured? Can I just pay the other driver without involving the insurance company? 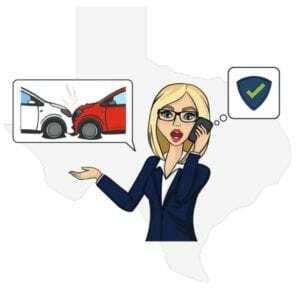 What are my options after a car accident in Texas? 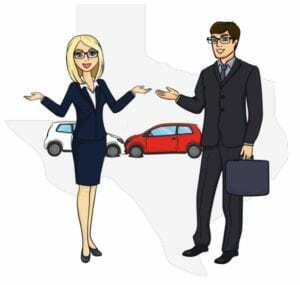 What are the minimum amounts of car insurance required in Texas? 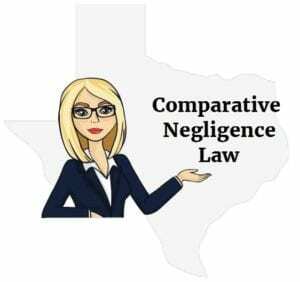 How does Texas comparative negligence law work? Will I get more money for my car accident claim with an attorney? How much do attorneys charge for car accident cases? How much can I sue for in Texas Small Claims Court? 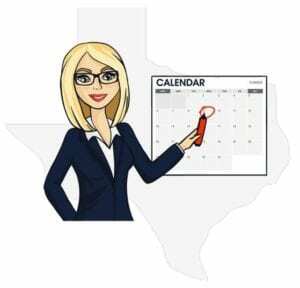 Where can I learn about filing a small claims lawsuit in Texas? Where can I find the small claims court closest to me? What if the insurance company won’t return my calls ? You’ve just been in an accident. Now what? Keep your wits about you and remain focused. There are rules to follow, laws to observe, and people do deal with. Check for injuries and call 911 to report the accident. If the accident results in injuries, or damage to any vehicle causing it to be disabled, you must notify the local police or county sheriff’s department immediately. Your location: Look for street signs, highway mile markers and landmarks. Be sure to tell the dispatcher which side of the road you’re on and the direction you were traveling. The more accurate your description, the sooner emergency services will arrive. If there are injuries. If you aren’t hurt or your injuries are minor, check the other people involved in the accident. Tell the 911 dispatcher if anyone is unconscious, bleeding, complaining of nausea, pain or discomfort, or is asking for medical assistance. Hazards: Tell the dispatcher if you see overturned cars, leaking fuel, traffic problems or any other dangers around the accident scene. Texas law enforcement officers from all jurisdictions are highly trained in accident investigation and management. If the accident occurred within city limits, then local police have jurisdiction and will respond. If the accident occurred outside city limits, the county sheriff’s’ department will have jurisdiction. 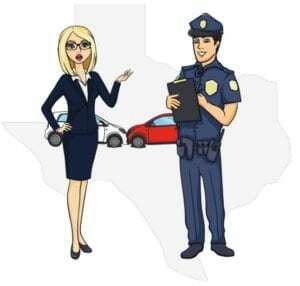 If the accident occurred on a Texas State Road, then the Texas Department of Public Safety (DPS) Troopers have jurisdiction. In some cases, there may be overlapping jurisdiction and more than one agency will respond. No, not really. You may attempt to speak with the investigating officer to give your opinion of the cause of the accident. However, the officer is not required to listen to your version of events or to discuss the accident with you. If the officer tells you to step aside, or gives you any other instructions, you should cooperate. Arguing with the officer, or behaving aggressively can cause you to be cited, or even arrested. It depends. If the officer asks you to identify yourself, including your full name and address, proof of registration, and proof of insurance, you must comply. However, if you’re being questioned by the police about possession of drugs, outstanding warrants, or other crimes, you have the right not to answer those questions. A traffic citation is not an admission of guilt, even if you sign it at the scene. It’s simply an agreement that you will appear in court to face the charge. Traffic court is the place to argue about a traffic ticket, not at the accident scene. You may purchase a copy of the police crash report online from the Texas Department of Transportation. In addition to contacting local law enforcement to report the accident, there are other things you’re required to do. 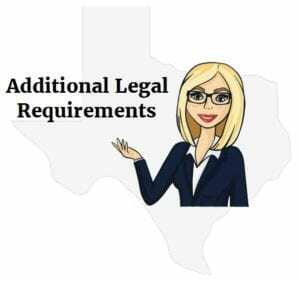 Texas law also requires drivers to render “reasonable assistance” to any person injured in the accident. This includes driving or making arrangements to get the injured person to a hospital so that they can receive medical attention. No. Texas has what’s known as a “Good Samaritan law.” In the case of a car accident, if anyone tries to help someone who has been injured, they cannot be held liable for civil or criminal damages unless they were intentionally negligent. If you strike an unattended parked car, you must stop immediately at the scene. Once stopped, attempt to locate the driver or owner of the car and report the accident. Give them your name and address and explain what happened. If you’re unable to locate the owner, write down your name and address along with an explanation of what happened, and leave the note on the vehicle. Some injuries are obvious. They can include bone fractures, head trauma, bleeding, and other serious injuries. However, your injuries may not be so obvious. Adrenaline can run through your body after an accident, masking symptoms of injuries. As a result, symptoms may not appear for hours, or even days after the accident. It’s not uncommon for people immediately after an accident to feel no more than shaken up, so they don’t seek medical attention. However, the next morning upon waking they find themselves unable to move their neck or limbs without substantial pain and discomfort. That’s why it’s important to be checked by the paramedics at the accident scene, and to see your doctor as soon as possible after a car accident. Failing to seek immediate medical treatment after an accident could spell big trouble for you later. The insurance company will jump at the chance to take the position that your injuries weren’t from the accident. Once that happens, it’s more difficult to prove that you deserve compensation for your injuries. The minutes following a car accident can be crucial in the development of your property damage and personal injury claim. Before long, the cars involved will be driven or towed away, and the other driver and witnesses will be gone. If you’ve sustained property damage or injuries in a Texas car accident due to the negligence of another driver, you need evidence to support your claim. When you’re the victim of car accident caused by someone else, you expect the at-fault driver’s insurance company to compensate you for your losses. Starting at the accident scene, the evidence you gather will prove the other driver did something wrong or failed to act responsibly. Property damage can include the cost to have your car repaired, the cost of a rental while your car is being repaired, the cost of personal items damaged in the crash, and the value of your car if it’s a total loss. Bodily injury damages can include the costs of your medical, dental, chiropractic, or mental health treatment; medications; medical devices like wheelchairs and crutches; therapy, pain and suffering, and much more. Passengers: Ask for passengers’ names, addresses, birth dates, and contact information. Passengers from the other car can refuse to talk to you, but you can make detailed notes for yourself about each passenger, what they looked like, and their behavior. Vehicles: Look for the make, model, year, license plate number, expiration date, and vehicle identification number (VIN) for each vehicle in the accident. The VIN can usually be found on the left corner of the dashboard near the windshield, or inside the door jamb of the driver’s side door. The VIN may also be found on the driver’s insurance card. Diagrams: Make a drawing showing the position of the cars before and after the crash, and the direction they were headed. Show road conditions like potholes, standing water, or construction zones. Add notes about the weather, and anything else that contributed to the accident. Photographs and Video: A picture may be worth a thousand words, but multiple images and video can be worth far more than that. Use your digital camera, cell phone or other electronic device to take as many photos and videos of the crash scene as you safely can. Be sure to include sound and get shots from many different angles. Photographs and videos are compelling evidence that makes it difficult for others involved in the accident to later change their story about what they said and did. Witness Statements: Witnesses statements can be very useful to your insurance claim. Witnesses are under no legal obligation to speak with you or give a written statement, but you are free to ask potential witnesses if they saw anything that could be helpful to your claim. If you can find a willing witness, get their names and contact information. Ask them to write down what they saw and heard. This is especially helpful if they’re willing to state the other driver was at fault and why. Don’t worry about the legal formalities of a witness statement, but be sure the witness signs and dates each page of their written statement. Your auto insurance policy is a legal contract between you and your insurance company. Take a close look at your insurance policy. Almost every policy has a Notice of Occurrence and Cooperation clause. The clause means you agree to tell your insurance company when you are in an accident, and you agree to cooperate with your insurance company’s accident investigation. Your insurance company needs to hear your side of the story as soon as possible after the accident. This is especially important if the other driver decides the accident was your fault and not theirs. When you bring your insurance company into the loop, you’re giving them a head start on protecting your interests. You may be convinced the other driver was at fault. The driver may have been texting, speeding, may have rolled through an intersection, struck your car from the rear, or some other form of negligence which resulted in the accident. Even when fault appears obvious, it’s always possible the at-fault driver may later decide you caused or in some way contributed to the accident. There’s nothing to stop the other driver from blaming you, so make sure your insurance company hears from you first. You may be tempted not to report a very minor accident to your insurance company. The fender-bender may appear to have been without injuries and no big deal. However, with a closer look you may find that not reporting the accident to your insurance company is a serious mistake. Delayed Symptoms: The other driver or passengers may believe they weren’t injured, but the onset of symptoms for some injuries can take hours, sometimes even days to appear. This makes injuries you didn’t think existed suddenly become very real. No Insurance: The other driver may not have property damage or personal liability coverage. If so, that’s the last thing they want you to know. Once you learn the other driver doesn’t have insurance, you might call the police. The other driver knows that if that happens. they will be ticketed, or worse, arrested. Fraud: While at the scene, the driver and his passengers may say they weren’t injured. Later, they may decide to “cash-in” on the accident by filing fraudulent claims of whiplash and soft tissue injuries. Yes. There are many free mobile applications to help you report an accident to your insurance company. If the other driver caused the accident, you need to contact their insurance company to begin the process of seeking compensation. Using the insurance information obtained at the accident scene, call the driver’s insurance company and tell them you want to file a claim. Once you have notified the other driver’s insurance company, you’ll be referred to a claims adjuster. In many cases, there are two adjusters assigned to your claim: one to handle the property damage and the other to handle your injury claim. Be sure to obtain both claim numbers. You’ll need them for future communication with the insurance company. No! First, you have a contractual obligation to your insurance company to report the accident. Failing to notify your insurance company is a breach of your contract. Second, some injury symptoms may not show up for hours or sometimes even days. It’s possible the other occupants of the other car honestly believed they weren’t injured at the scene. But you never know how anyone will feel later. One or more people from the other car may begin to experience symptoms and later decide to pursue you for major damages. Third, someone from the other car may hire an attorney. By failing to report a Texas car accident to your insurance company, they would have no knowledge of the accident. This would put your insurance company at a disadvantage in the claim. Laurie and Howard were involved in a minor “fender-bender” in which Laurie hit the back of Howard’s car. They immediately pulled over, and exchanged insurance and contact information. The only damage was a scratch to the rear bumper of Howard’s car. Howard told Laurie that he wouldn’t mind keeping the accident from the insurance company as long as Laurie paid him directly for the repairs to the bumper. He told her the repairs probably wouldn’t be more than $50 – $75. Laurie agreed and they both left the scene. Because of her agreement with Howard, Laurie chose not to report the accident to her insurance company. She believed there was no practical reason to call them and thought if she did they would raise her premiums. The next morning Howard experienced some pain in his shoulders and neck. His wife took him straight to urgent care, where the doctor determined he might have suffered a whiplash injury in the accident. After conducting an MRI and CT Scan, Howard was diagnosed with a soft tissue injury. Howard hired an attorney to pursue his personal injury claim against Laurie. Over the next month, Howard received ongoing treatment from a local chiropractor. The chiropractor confirmed in a written statement that Howard was being treated for whiplash. Howard’s wife also gave a statement to the attorney confirming she witnessed the pain and discomfort her husband was suffering, and that she had been assisting him with bathing and driving. Sixty days after the accident, Laurie received a certified letter from Howard’s attorney. She was in shock to learn that Howard was seriously injured in the accident and was blaming Laurie. Laurie hadn’t contacted her insurance company after the accident, believing that her agreement with Howard at the scene was sufficient. She was terrified to learn that Howard’s attorney was now demanding $25,000 in compensation for his client’s injuries and related damages. Laurie didn’t know what to do. She thought if she contacted her insurance company at this point they would refuse to defend her. If they did help her, she feared they would decide not to renew her policy or cancel it altogether. By failing to promptly report the accident to her insurance company, Laurie not only violated the terms of her policy, she also gave Howard’s attorney a substantial head start on the claim. By the time Laurie received the letter from Howard’s attorney, the attorney had already located witnesses to the accident, obtained copies of Howard’s medical and chiropractic records and bills, secured a medical narrative from Howard’s chiropractor confirming his injuries and treatment, and a statement from Howard’s wife. If Laurie had contacted her insurance company right away, the company would have opened an investigation into the claim two months ago. Instead, they were now 60 days behind, scrambling to investigate the accident and determine how to handle Howard’s claim. Texas is not a no-fault insurance state. 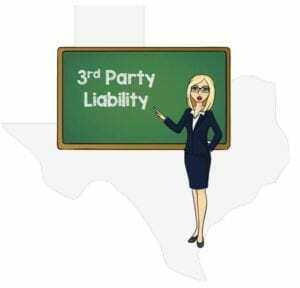 Instead, Texas follows a 3rd Party Liability Rule. In no-fault insurance states, both parties in a car accident turn to their own insurance companies for compensation. 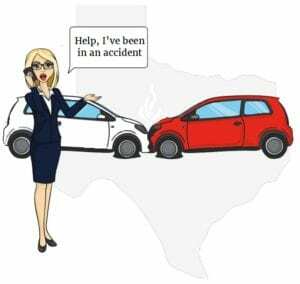 However, in a third party fault state (like Texas), a car accident victim has the right to pursue the at-fault driver or the at-fault driver’s insurance company for compensation. This can be for the cost of damaged property, and for medical bills and related damages sustained as a direct result of the accident. Texas law requires drivers to be financially responsible for the accidents they cause. Most drivers meet this requirement by purchasing an auto insurance policy with the minimum coverage limits mandated by law. Liability Insurance covers injuries or damage to other people or property when you are to blame for an accident. 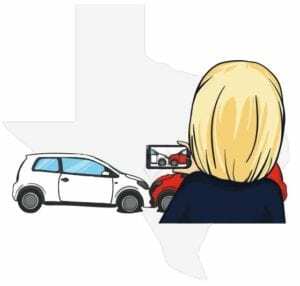 Drivers in Texas must be insured for at least the minimum liability coverage for bodily injury in the amounts of $30,000 per person and $60,000 per accident, as well as $25,000 per accident for property damage. Texas follows a system using the modified comparative negligence law, sometimes referred to as “the 51% rule”. In states following this rule, an injured party can only recover damages if they were less than 51% at fault. If you are 51% or more to blame for the accident, you won’t be able to recover any damages from the other driver. If your liability is 50% or less, you can still receive a settlement, but the amount will be adjusted according to your share of liability for the accident. Laurie was driving to work and stopped at a red light. Ritchie was texting and failed to see Laurie. He crashed into the rear of Laurie’s car, causing Laurie to be seriously injured. Laurie filed an insurance claim for $100,000 with Ritchie’s insurance company. This amount represented her medical bills and related damages, including her pain and suffering. In this case there was no evidence Laurie was at fault in any way. Since Ritchie was 100% at fault, Laurie would be entitled to 100% of her damages in the amount of $100,000. Laurie was driving home and stopped at a red light. Richie was driving behind her. He was looking away from the light and didn’t see that she had stopped. He collided with the rear of Laurie’s car, causing her to be seriously injured. Laurie filed an injury claim with Richie’s insurance company for $100,000. This amount represented her medical bills and related damages, including her pain and suffering. The claim could not be settled and went to trial. During the trial witnesses testified they saw the light turn green but Laurie didn’t move. The witnesses said the light had been green for several seconds, and Laurie was still stopped when Richie collided with the rear of her car. The jury determined Richie was at fault for colliding with the rear of Laurie’s car, but also found Laurie contributed to the accident by failing to move when the light turned green. As a result, the jury set Richie’s portion of blame for the accident at 70% and Laurie’s at 30%. Instead of awarding Laurie the $100,000 she sued for, they awarded her $70,000, representing a reduction for her 30% fault for the accident. Laurie was driving in the right lane of a four-lane highway and Richie was driving behind her. Thinking Laurie was driving too slowly, he decided to pass her to the left. Once he had passed her vehicle, Ritchie signaled his intention to move back into the right lane in front of Laurie. As he re-entered the right lane, he hit the front of Laurie’s car causing a crash and seriously injuring Laurie. Laurie filed a lawsuit against Richie, demanding $100,000 for her injuries, pain and suffering. At trial, witnesses testified that instead of letting Richie move back into the right lane, Laurie sped up, making it impossible for him to safely re-enter the lane without hitting her car. The jury found both drivers to be at fault in the accident. They believed Richie should have made sure he was clear of Laurie’s car before re-entering the right lane. However, they also believed the accident might not have happened at all if Laurie hadn’t sped up to keep him from passing her. As a result, the jury set Laurie’s portion of blame at 60% and Richie’s at 40%. Under Texas Comparative Negligence rules, because Laurie was found to be more than 51% at fault, she was prevented from receiving any compensation at all. Some car accident claims can be settled for an appropriate amount of money without hiring an attorney. Other claims are more difficult, requiring expert legal representation to get anywhere near the level of compensation appropriate for your injuries, pain and suffering. There are generally two types of injuries arising out of car accidents: “soft tissue” and “hard injuries”. Soft tissue injuries include strains to ligaments, minor bruising and abrasions, first degree burns, whiplash, and other relatively minor injuries. These injuries don’t generally result in unusually high medical or therapy bills. They also don’t involve complex issues of law. Because of this, a victim can negotiate their own injury claim with the insurance company. Soft tissue injuries typically don’t have a very high claim value. You may be better off financially by settling the claim directly with the insurance company. Hard injuries are much more serious, and can include head trauma, fractures, third degree burns, deep gashes requiring stitches, and other injuries requiring expensive, specialized medical care. Compensation for a serious injury claim can be substantial. There’s just too much to lose by representing yourself. 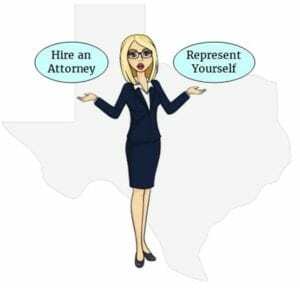 By not hiring an attorney, you will likely end up settling for an amount significantly less than an attorney could have obtained for you, even after attorney’s fees are deducted. Insurance companies know claimants who go it alone can only negotiate so far. An insurance claims adjuster may lead you to believe you’re an expert negotiator. But the truth is, that’s something they tell nearly everyone who goes up against them unrepresented. This is just their way of trying to get your guard down so they can offer you a low settlement amount. At some point in the negotiations the claims adjuster will most likely say, “that’s our final offer.” At that point, it’s take it, or leave it. Hard injury claims often require filing a lawsuit to get a fair amount of compensation. Experienced personal injury attorneys can learn what the driver’s policy limits are, whether the driver has a past record of traffic accidents, traffic tickets, prior arrests, prior or pending lawsuits, and much more. Insurance companies don’t like lawsuits. They know once a lawsuit is filed, they’ll have to pay huge legal fees to corporate defense attorneys. Lawsuits almost always require pretrial discovery, including depositions, interrogatories, subpoenas for production of documents, and more. Reputable personal injury attorneys don’t charge for initial office consultations. When you choose the attorney to fight for you, the attorney will likely agree to represent you on a contingency fee basis. A contingency fee means you won’t pay the attorney any legal fees until the attorney successfully settles your case or wins it at trial. If your attorney fails to settle your injury claim, or loses the case in trial, you’re not required to pay any attorneys fees or expenses. Contingency fees can range from 25% to 40% depending on the time it will take to resolve the case, its complexity, and whether or not the case has to be tried in front of a jury. You may consult with several attorneys before choosing the right one for your case. For your initial consultation, bring copies of your medical records and bills, along with a copy the accident report, photographs, witness statements and other information related to the accident. The attorney will review the evidence, and listen to your side of the story. After reviewing your case, the attorney will talk with you about the potential value of your claim, whether or not they believe the claim will settle, or if the claim may have to be tried in court. There are times when filing a lawsuit against an at-fault driver may be your only option. When this happens, you can consider suing the driver in Texas Small Claims Court. Texas small claims lawsuits are heard in Justice courts, with jurisdiction to hear cases up to $10,000. If you decide to file a lawsuit in small claims court, you must sue the driver who caused the accident and not their insurance company. Where can learn about filing a small claims lawsuit in Texas? 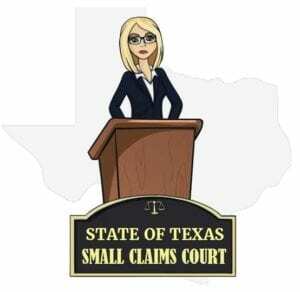 For more information on filing a small claims lawsuit in Texas, visit How to Sue in Small Claims Court. To locate the Small Claims Court closest to you, visit the Texas State Law Library section Filing Information for Select Texas Counties. If you’re the victim and you fail to settle your claim with the at-fault driver’s insurance company within the statute of limitations period, you lose your legal right to pursue the at-fault driver or the insurance company for compensation. 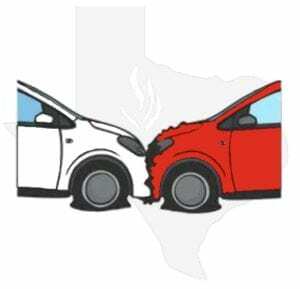 Texas has a two (2) year statute of limitations for car accident claims. The statute begins to run on the accident date. The insurance company and the adjuster handling your claim have no legal obligation to settle within the statute of limitations period. You won’t get any sympathy from them if you miss the date. It’s also not a legal defense that they refused to return your calls, emails or letters. If you miss the statute of limitations, it’s entirely on you. You can protect your claim by filing a lawsuit against the at-fault driver before the statutory deadline. Once a lawsuit is filed, the statute of limitations is “tolled” or put on hold. If the statute of limitations on your injury claim is about to expire, meet with a local personal injury attorney. It won’t cost you anything to find out what an attorney can do for you. Don’t wait until the evidence is cold and the deadline is looming before calling an attorney. Act now to protect your claim and get the compensation you deserve for your injuries and suffering. Is it still a hit and run if police find the car? Delayed filing an injury claim for one year after rear end accident with truck?